Explanation: Today's solstice marks the northernmost point of the Sun's annual motion through planet Earth's sky and the astronomical beginning of the northern hemisphere's summer. But only two days ago, the Full Moon nearest the solstice rose close to the ecliptic plane opposite the Sun, near its southernmost point for the year. 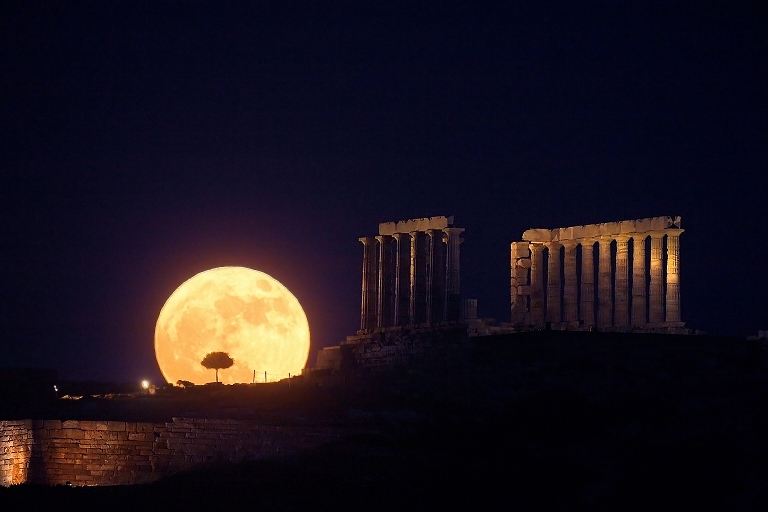 Astronomer Anthony Ayiomamitis recorded this dramatic picture of the solstice Full Moon rising above Cape Sounion, Greece. The twenty-four hundred year old Temple of Poseidon lies in the foreground, also visible to sailors on the Aegean Sea. In this well-planned single exposure, a telescopic lens makes the Moon loom large, but even without optical aid casual skygazers often find the Full Moon looking astonishingly large when seen near the horizon. That powerful visual effect is known as the Moon Illusion.